Holiday time is a busy time around our house. I find every year the holidays seem to start earlier. It can be tough to balance cooking and entertaining with our already busy schedules. 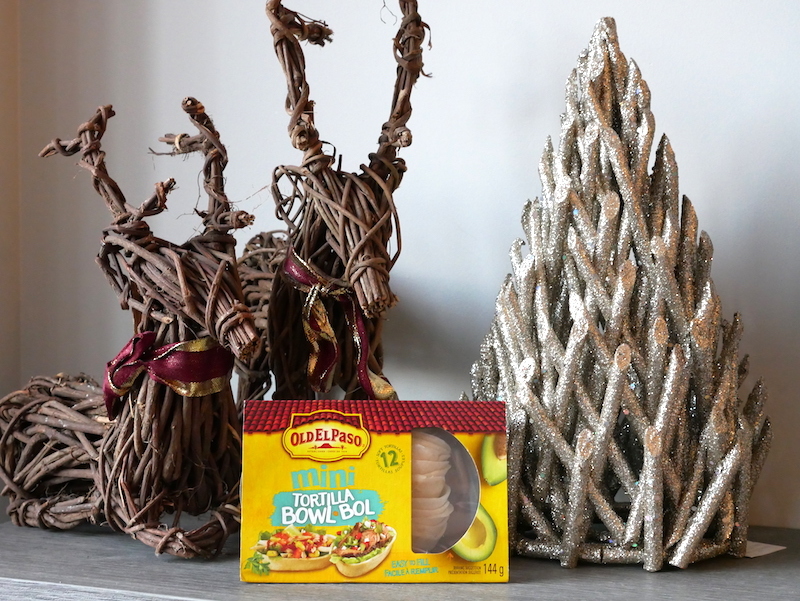 Luckily, Old El Paso has a number of quick and easy hacks to make food for holiday parties using Old El Paso Tortilla Bowls to save time. 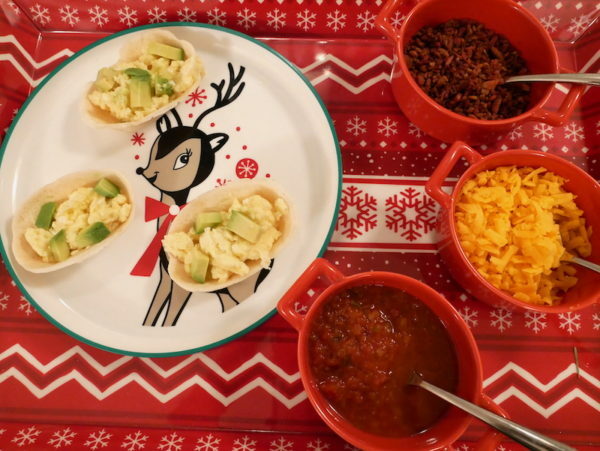 Here are my 5 favourite holiday food hacks using Old El Paso Tortilla Bowls for brunches, dinners and even desserts. As a mom, I find that I often prefer to host our friends for brunch over dinner. We can all get together here without having to find sitters and enjoy food and family. While I enjoy hosting brunch, I also don’t want to be tied to the stove trying to make food for everyone. I have found these two breakfast hacks that are quick and easy leaving me more time to actually host our friends. These taste as good as they sound. Better than that they are customizable for vegetarians, meat eaters, picky kids and everyone in between. My kids love helping shop for and chop up fresh veggies to be added to the bowls and always request an addition of bacon. I find that I can quickly prepare the egg base as instructed in the Breakfast Taco Bowl recipe and everyone loves getting to fill up their own Old El Paso Mini Tortilla Bowls. My only tip is to keep quite a few on hand. Once people start filling they don’t seem to want to stop. Another quick and easy entertaining hack is to take the fuss out of quiche. I absolutely love to make quiche but find that more often than not the crust can be too much of a hassle. Recently, I tried this Tomato Quiche Tortilla Bowl recipe and fell in love. With a prep time of around 20 minutes, I was able to make a whole batch of these in under an hour. For brunch with friends, I can serve them hot out of the oven without having to cut up individual slices and so far they’ve been a huge hit. I also love that you can set out a few extra toppings like avocado and bacon so again friends can customize these easily. As Fall turns to Winter, I find that I quickly start craving comfort food. At my house, pulled pork is one of our favourite winter meals. Once a week, I try and get together with some mom friends to defeat the Wednesday blues and share a meal. 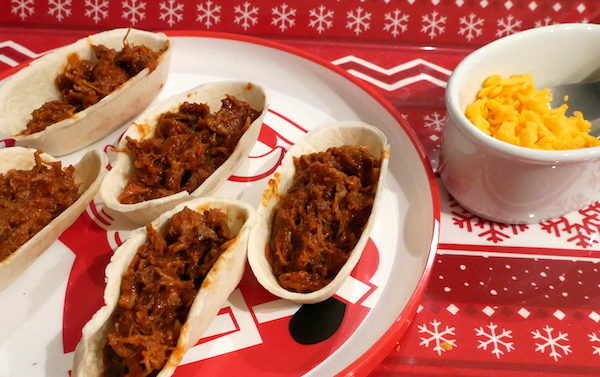 I recently tried out these Memphis-Style Pulled Pork Mini Taco Bowls and they were a huge hit. The best part for me is that I can prepare this dish in a slow-cooker while my kids are at school and then have more time to catch up with my friends while the kids play before dinner. The recipe makes enough for 12 and it was a sufficient amount for 3 moms and 6 kids with leftovers for lunch the next day. Now this is where things get really interesting. As much as I rely on the Old El Paso Mini Tortilla Bowls, I never imagined using them for dessert. That was until Old El Paso introduced me to these two dessert hacks that are next on my list to try. Yep. Churro Tacos. How good does that sound? I’m not quite sure how one makes a churro and frankly I’m not about to find out. Still when I saw this hack, I knew I could do it and it would be a huge hit with my kids and our guests. Once you churro your tortilla bowls, as per the Churro Taco recipe, you can choose to provide a few options of ice cream flavours, fruits and nuts and sauces like chocolate and caramel to make dessert even more fun. My son Will is obsessed with Cannoli. While he requests it on a regular basis, his requests tend to fall flat as we haven’t found anywhere nearby to pick some up. 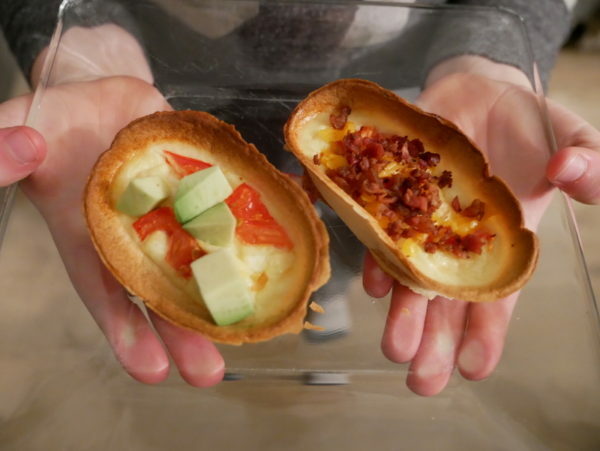 When I saw this Cannoli Mini Taco Bowls hack, I knew he would smile from ear to ear after trying this dessert. With a longer prep time of about an hour, this is the perfect end to a fun weekend family meal or holiday party. Because everything can be prepped ahead of time, the dessert is easy to serve at holiday parties and takes little time to assemble when you are ready to serve. The holidays are absolutely my favourite time of year to entertain. Using hacks like these can save me tons of time and make sure that I also get to enjoy some of the party. I also love that my kids can help with every single one of these recipes and will feel accomplished and proud to have taken part in the preparation of these great meals. Before you sit down to make your holiday entertaining meal plans and grocery lists make sure to check out the Old El Paso Tortilla Bowls. They can not only save you time but seriously up your entertaining game leaving you with more time to spend with friends and family this holiday season. Disclosure: This post is part of a sponsored program. I received compensation as a thank you for my participation. This post reflects my personal opinion about the information provided by the sponsors.